Our Oral and Maxillofacial Radiology Service provides a full scope of diagnostic imaging services, including capture and interpretation of conventional and cone beam CT (CBCT) scans by a board-certified oral and maxillofacial radiologist. A comprehensive written report that addresses clinical concerns and interprets any pathologic findings or variants of normal. Clinicians should be aware that they are responsible for the detection and diagnosis of pathologic findings throughout the entire volume of their patients’ CBCT scans. 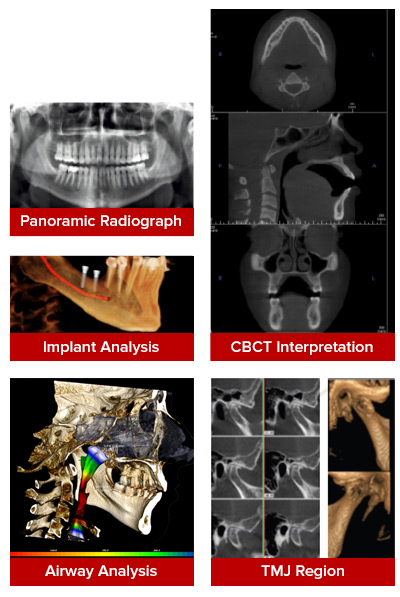 Digital radiograph interpretation including intraoral and panoramic images. Information for referring doctors: Getting started with our HIPAA secure PowerShare Network.